Congratulations! You’ve been released from a rehab program and have shown dedication and commitment to beating a dependency on drugs or alcohol. 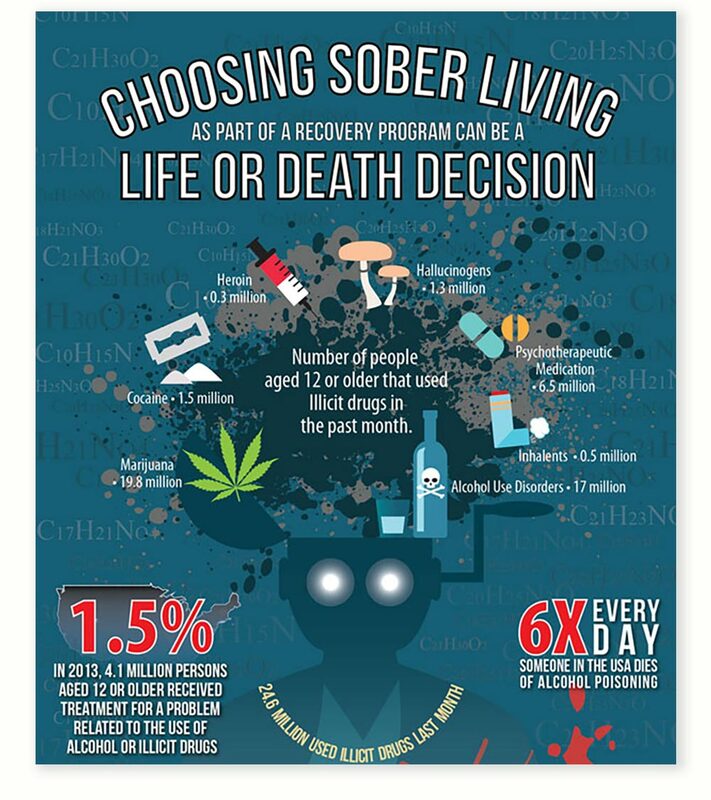 A member of society again, you’re officially sober – a fact to truly celebrate. But as the people who know and love you celebrate your release, you might feel scared to death that you’ll trip up at a social outing, guzzle a couple of drinks, and turn back into that Mr. Hyde personality you’ve worked so hard to shed. This is the nightmare that lurks around every corner, in a restaurant, party, outdoor event, or concert venue, because wherever humans gather and socialize, you can bet that alcohol will be there. Here’s a deep truth: sobriety not only means giving up a substance or behavior – it means having to relearn how to navigate through life. Without structure in your life – a consistent daily routine – you’ll find it hard to successfully stick to sobriety. The new life you’re trying to build is a fragile one in the beginning; it could collapse, which is why you should take baby steps when you venture out into society. The last thing you want is to become overwhelmed as you repair, rebuild, and rediscover a life that you’re tenderly traversing in open vulnerability. In the process, you’ll likely address problem areas, such as ruined relationships with friends and family, your affected finances, work, and so on, and this may, at times, feel like too much. So, take it slowly and one day at a time. In the beginning, schedule most or practically all hours of the day to cover all your essential tasks, such as a fixed sleep time, cooking and eating hours, work, exercise, your treatment programs, doctor appointments, other errands (such as grocery shopping), and spending time with friends and family. Eventually, as you steadily grow healthier, you’ll find yourself loosening your schedule. It’s impractical to imagine you’ll stick to tightly-scheduled days forever – most people simply don’t operate that way. When the time is right, you’ll feel ready to begin socializing again as the new, sober you. For recovering addicts who feel especially vulnerable – whether due to guilt about the past, being highly insecure around new people, or uncertainty of remaining sober while out and about – having a dog by your side can take the edge off of most situations. By facilitating low-pressure interactions with others, a cute, sociable dog can help build your confidence while giving you that unique kind of love and support that is pure and non-judgmental, something most recovering addicts need in large amounts. Plus, by adopting a friend in need, you’ll have be saving a life – and that’s in addition to having already saved your own life by working hard on your sobriety. Don’t worry – if you’re not ready to own a dog, you can still benefit from animal therapy. You can offer to watch a friend’s beloved pooch while they’re out of town or at work, or you can sign up to be a pet sitter or dog walker. Animal shelters are also always looking for volunteers, and can always use a hand at their facility and adoption events. Another failsafe way to get out there and practice being sociable while helping others is to sign up and do volunteer work at a local nonprofit or charitable organization. For sure, there is a charity in your vicinity that caters to an interest you hold dear. VolunteerMatch.org is a terrific online service that pairs you up with an organization from any one of a range of categories, such as arts and culture, animals, computers and technology, environment, education and literacy, sports, faith-based, etc. You can opt to volunteer your time virtually or in person at a local organization. Being newly sober is a delicate, trying time in your life. Partaking in any of these activities while sticking to a daily-life routine will greatly help you find the confidence to embrace your new, sober self while conquering nerve-wracking social situations.